In the context of the REHVA Brussels Summit, on 12 November ALDREN organized its first training workshop. It was an interactive event with live polling sessions, open discussion and direct access to the speakers’ presentations on their own devices. Over 50 participants among REHVA experts and EU level stakeholders joined the workshop to learn more about the project strategy to consolidate, extend and implement the European Voluntary Certification Scheme (EVCS) policy instrument along the deep renovation process. You can access here all the presentations. 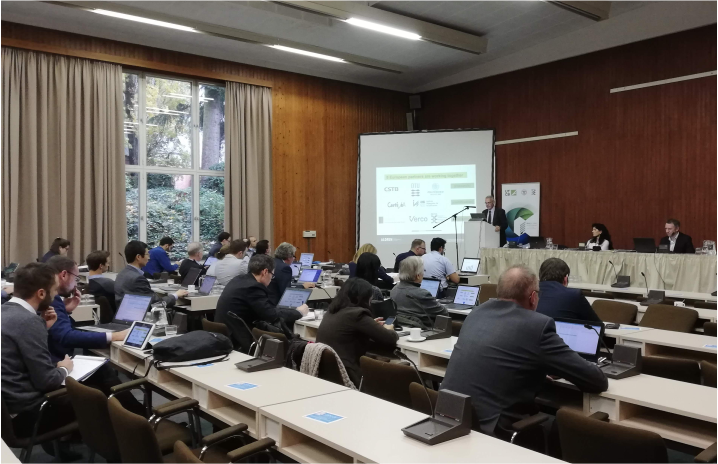 The ultimate goal of the organizers was to understand to which extent energy efficiency stakeholders of the REHVA network are interested and willing to endorse the certification scheme proposed by ALDREN and how its contents are relevant for training building professionals. In this regard, the live poll gave interesting insights. For instance, almost all participants (95% of respondents) declared that the EVCS is interesting for their own activities, considering comparability, reliable energy savings and reliable calculation methodology the major drivers for its market uptake. Reliability and comparability come along with the use of the new set of EPB standards for energy calculations, which is welcome in voluntary certification schemes by over 90% of respondents. In fact, the inclusion of the whole EVCS in voluntary certification is perceived as a winning factor by most of the audience (73%). The relation between EVCS and Energy Performance Certificates, instead, remained an open point, with a slight majority of participants suggesting complementarity rather than replacement. The live poll also provided directions in terms of parameters to be included in the ALDREN extension of the EVCS. The audience expressed their preference for primary energy as energy indicator. In terms of financial indicators, market value and productivity were both recognized as key parameters by 50% of the respondents. However, 63% of them believes that benefits resulting from market value are the most reliable ones. Indoor Environmental Quality parameters were generally found adequate and the proposal of including purely IEQ-oriented measures in overall renovation projects was welcomed by 76% of the audience. However, the acceptable amount of extra costs for these measures remained uncertain. The use of an ALDREN Building Renovation Passport was also generally approved by the workshop participants (65% of respondents), that would like to find in it a general overview on building data at first sight. To have a closer look to the questions and the opinions of ALDREN workshop participants, access here all the results of the live poll.